New Beginnings? LOCK NUT–Review and Giveaway! Hi there! Today I’m sharing a review for a newly released contemporary M/M mystery romance from JL Merrow. 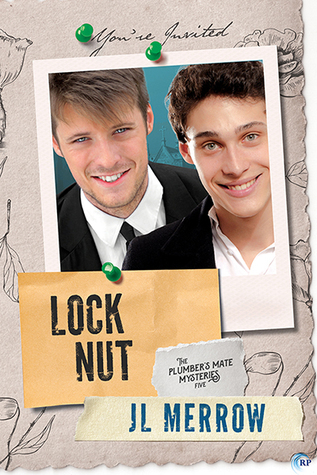 LOCK NUT is the fifth book in the Plumber’s Mate series and I hope it isn’t the last. I adored PRESSURE HEAD, RELIEF VALVE and BLOW DOWN. For those who haven’t picked up these books, they feature a plumber with a knack for finding water and lost/hidden items–including dead or missing people, and his former bully who’s now his fiance. It’s set in England, and has some absolutely awesome vernacular. Tom Paretsky–maybe he is Polish–is a plumber with a unique knack for finding what’s hidden, including dead bodies. His fiance, Phil Morrison, is a private investigator, so it’s a handy skill to have. In this story Tom and Phil are planning their wedding, but it’s not going well, especially when Tom’s face gets put on the telly as a suspect in a murder. Tom’s committed to finding the true killer before another death gets put on his head. And Phil’s determined to make it to the altar–with Tom intact. Though moving in together hasn’t been without issues. Tom’s a little territorial, and he’s slow to adapt to big changes. Like finding out about his paternity issues and building his familial relationships. Phil knows Tom needs nudging, even when Phil goes a bit far. As with the other books in the series, the sexytimes are on the down-low but Tom’s raw wit keeps the pace cracking along and we know how very much he adores Phil. That’s totally reciprocated, too, even though Tom has self-esteem issues. Tom’s efforts to track down the killer are more personal this time. He’s making friends with the kooky family of the grieving widow, knowing that she’s the prime suspect. I did like all the misdirection, even if I had picked out the killer in the beginning. The harrowing bits have the appropriate amount of tension, and enough suspense to make me wonder if we’d hear those wedding bells pealing, or not. I loved how it ended, and I really hope to see more of these books in the future. Interested? You can find LOCK NUT on Goodreads, <a href=”Riptide Publishing, Amazon, Barnes & Noble, iTunes and Kobo. I received a review copy via NetGalley. Pop on over to my pal Joyfully Jay and leave a comment to be entered to win a $10 Amazon gift card. She writes across genres, with a preference for contemporary gay romance and and mysteries, and is frequently accused of humour. Her novel Slam! won the 2013 Rainbow Award for Best LGBT Romantic Comedy and her novella Muscling Through and novel Relief Valve were both EPIC Awards Finalists. JL Merrow is a member of the Romantic Novelists’ Association, International Thriller Writers, Verulam Writers’ Circle and the UK GLBTQ Fiction Meet organising team. Find JL Merrow online on her website, twitter and Facebook.